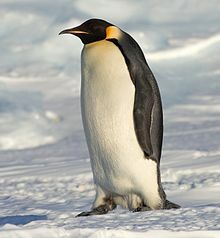 The adult Emperor Penguin stands up to 48 in. tall. The weight ranges from 49 to 99 lbs. Ear patches are bright yellow. Emperor penguins breed on the iceshelf, away from predators such as skuas (think angry birds) that take eggs and chicks, on breeding grounds that may be as far as several hundred kilometres from the open water. The males leave the feeding areas in early April (autumn in Antarctica) and fast during 6 weeks of courtship and for a further 2 months while brooding (talk about missing a meal). Only one egg is laid, and the male carries it on his feet and broods it in a special flap of feathered skin that extends from his abdomen.